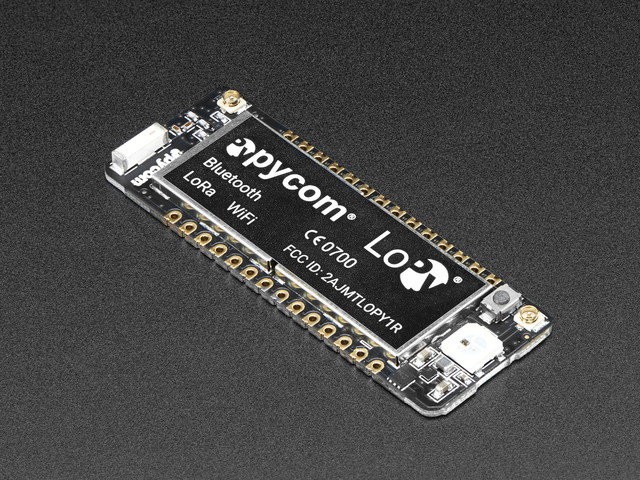 With LoRa, Wifi and BLE, the Pycom LoPy is the only triple bearer MicroPython enabled microcontroller on the market today – the perfect enterprise grade IoT platform for your connected Things. With the latest Espressif ESP32 chipset the LoPy offers a perfect combination of power, friendliness and flexibility. Create and connect your things everywhere. Fast. The LoPy can act as both a LoRa Nano Gateway and a multi-bearer (LoRa, WiFi and BLE) development platform. It is programmable with MicroPython and the Pymakr IDE for fast IoT application development, easy programming in-field, and extra resilience with network failover. The best blend of speed to deployment and access to new LPWAN networks rolling out across Europe, USA, Africa and India.